Held at Letterhead Sign Supply facility. 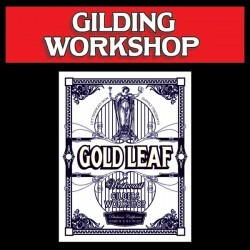 Workshop covers basic Commercial Gilding, these are the same techniques taught to Sign-Shop apprentices. Students come away with 2 Reverse Glass Projects. #1. Glue Chipped Glass Signs and Awards, join us for this hands on project making a Glass sign designed as a vintage advertisement of the technique. We'll teach about the Materials, Tools & Techniques in order to create Glue Chipped Glass and Frosted Glass along with how to water gild it. #2. Reverse Glass Gilded Panel Sign in the classic Chicago-New York style. Also known as a Two-Tone in which we will be teaching you how to make gold or silver mirroring which is called Water Gilding, for out-lines on this project. Each project will be Silk-Screened after being Gilded to save time. Then we'll teach you to surface gild (Oil Gilding) inside of mirror gilded outlines we create together. We'll discuss the history and the benefits of how the Light play of Two-toned Gilds work when combined correctly for a successful Gilding in Art or Advertising. We find this time helpful for those who need to catch up or if your a fast study be one of the few that have actually been able to finish these projects by getting all of the paint work wrapped up before heading home. So be ready to work hard and go home tired!